Apple pie is one of the most favorite desserts in the United States and Europe. May 13 is a day devoted to the apple pie. The first recipe for apple pie printed on paper is from England, from year 1381. The list of ingredients included in the recipe was: good apples, good spices, figs, raisins, pears, saffron and a dough. Apple pie was a popular food in homes in the United States in the eighteenth century, just before the European colonization of America. In order to distinguish between the old Americans and the new immigrants, they would say: "American like apple pie" which meant "typical American" . In the 19th and 20th centuries the apple pie became a symbol of American prosperity and national pride. The newspapers wrote that during the Second World War, when journalists asked the American soldiers why they were going to war, their answer was: "For Mom and for Apple Pie". In 1970, advertisers used an advertising jingle in the patriotic essay: "Baseball, Hotdogs, Apple Pie and Chevy." 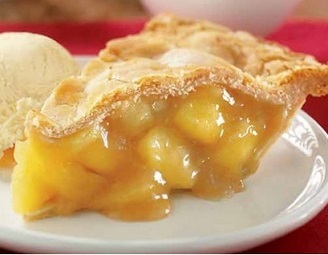 New Mexico has a city called Apple pie, named after Apple Pie. There are lots of recipes for apple pie online. So for the apple pie day, prepare yourself or go eat apple pie in a cafe. The most delicious is an apple pie with a scoop of ice cream and whipped cream on the side. The apple pie day is celebrated in the US by apple pie eating, preparing the biggest pie contests and more.